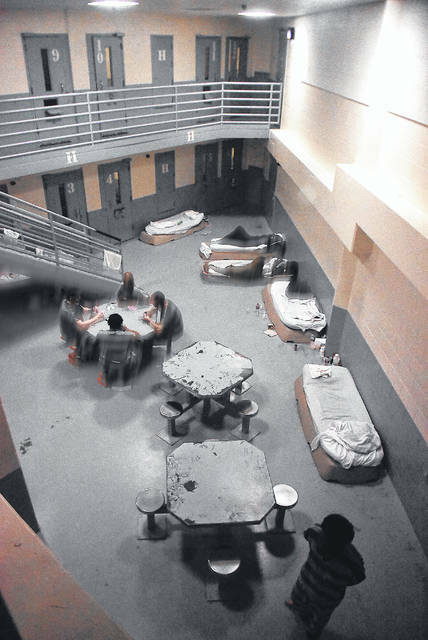 The Allen County jail was considered overcrowded by an average of 73 people every day of 2018, leading jailers to place mattresses in common areas of the jail in addition to designed sleeping spaces. Lima attorney William Kluge listens in court as he represents a defendant. LIMA — The hallmark of the legal system in the United States is the premise that all persons are considered innocent until proven guilty beyond a reasonable doubt in a court of law. But innocent doesn’t necessarily mean free, at least from an outward glance. 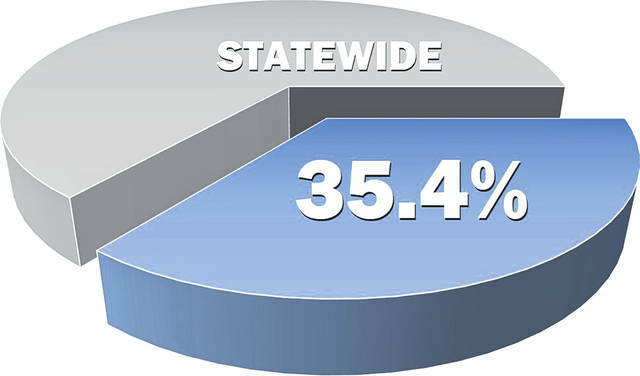 According to a recent study by the Ohio Department of Rehabilitation and Correction, 35.4 percent of all local jail inmates statewide have yet to be convicted of a crime but are simply incarcerated awaiting trial. Those numbers are even higher in northwest Ohio. More than 47 percent of the 242 prisoners housed at the Allen County jail on the final day of January were awaiting trial, according to figures provided by the Allen County Sheriff’s Office. In Auglaize County, 36 of the 83 inmates — 43 percent — sat behind bars having yet to be convicted of any crime. And in Putnam County, 43 percent of the jail’s 46 inmates remained technically innocent awaiting trial. In many cases, the ODRC study found, the inmates are being held because they could not afford bonds set by local judges. Those bonds can vary greatly, depending on the nature of the charges against individual defendants. Some are charged with crimes of violence and have been deemed a danger to the community. High bond amounts set by judges often preclude their release from jail pending trial. In other instances, persons charged with low-level felony offenses sit behind bars and watch the wheels of justice turn slowly because they cannot afford even modest bail amounts set, seemingly indiscriminately, by the courts. Still others sit in jail as a result of their own decisions. For myriad reasons, criminal proceedings in general are progressing more slowly than ever, according to those who work within the court system. 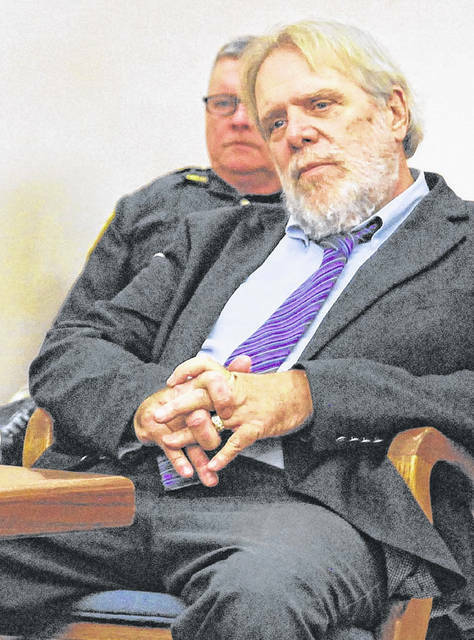 Lima defense attorney William Kluge has practiced law throughout northwest Ohio for 42 years. He has observed a trend in recent years where defendants are electing to drag out their own criminal cases. Kluge said defendants in increasing numbers are rejecting plea deals from prosecutors which could result in the most beneficial outcome to their cases. The reasons, he said, are many and varied. “No one wants to take responsibility for their actions,” the veteran attorney said. And, because time served in the county jail ultimately will be credited to any prison sentence those defendants may receive, many prefer to serve as much time behind bars as possible locally. “It’s easier to do time in the county (jail) than it is in prison; I hear that all the time,” Kluge said. Sometimes defense attorneys and court-appointed public defenders contribute to the slow pace of criminal cases, as they milk the system for their own financial benefit, Kluge conceded. Allen County Prosecuting Attorney Juergen Waldick agreed a lack of personal responsibility is becoming increasingly evident among defendants, many of whom hold out as long as possible to see if the state will offer an enticing, last-minute plea deal. Overall, Allen County’s prosecutor said, there seems to be no single factor that contributes to the time it’s taking to resolve cases. Similarly, he said, there appears to be no rhyme or reason for the number of cases brought to court annually. 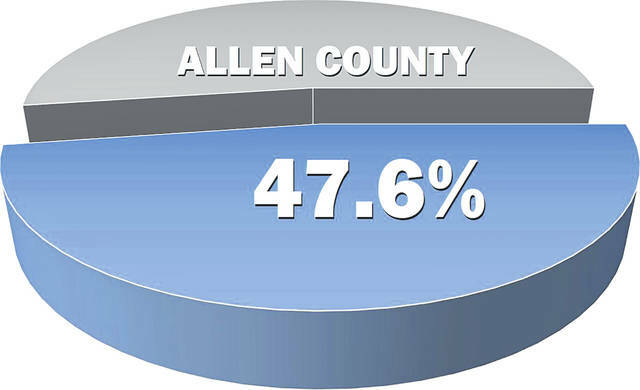 Last year there were 535 criminal cases filed in Allen County. In 2014, that number stood at more than 600, while in 2017 the caseload dipped to 440. Due in part to the high number of technically innocent men and women locked in county jails awaiting trial, Ohio lawmakers have flirted with the prospect of a statewide overhaul of the method of determining bail or bond (the two terms are interchangeable) for criminal defendants. Legislation to initiate bail reform stalled in the Ohio legislature last year as a bill failed to emerge from the Ohio House of Representatives’ Criminal Justice Committee. The bill called for judges to rely less on bail in favor of using objective risk-assessment methods to determine the likelihood of a defendant failing to show up in court or committing a crime after released. But as legislation languishes at the Statehouse, Ohio Supreme Court Justice Maureen O’Conner stepped in, announcing earlier this year she was assembling a task force to review Ohio’s current bail system. The group will compare the state’s bail and pre-trial systems to those in other states and will analyze state and federal litigation pertaining to the use of cash bail, with a report to be submitted to O’Connor and her fellow justices by April. Waldick believes an overhaul of the state’s bail system simply for the sake of reform itself is unnecessary. “It’s a mistake to draw conclusions simply by using statistics. Those who are calling for reform are trying to quantify behavior that isn’t quantifiable,” he said. “What are they looking at when it comes to numbers? Because there’s quite a difference between Putnam County and Cuyahoga County. “Bail is designed to make sure people show up for trial and also to protect the public,” the prosecutor continued. “It’s a matter of balancing the presumption of innocence versus the protection of the public. Those are competing interests, and I’m not sure how you resolve that. Terri Kohlrieser is less than six weeks into her tenure as an Allen County Common Pleas Court judge, but she is no stranger to dealing with bonds for criminal defendants. As a 10-year employee of the prosecutor’s office, she was primarily responsible for making bond recommendations for all of the county’s felony cases. While conceding lawmakers can implement laws governing how bonds are set, Kohlrieser said Rule 46 the Ohio Rules of Criminal Procedure is not a legislative matter but falls under the jurisdiction of the Supreme Court. But does Kohlrieser believe some type of bond reform is necessary? “If how bonds are being set depends on what county you’re in, then yes, that shows a need for some sort of reformation. But I’ve worked in this county for a long time, and I know this court has always been in compliance with Rule 46, which sets guidelines for establishing bond,” Kohlrieser said. Kohlrieser said judges are required to consider “all relevant information” when setting a defendant’s bond, including the nature and circumstance of the crime charged, including the use of a weapon; the defendant’s family and community ties; employment; mental condition; record of convictions and appearances at court proceedings; and whether the defendant is on parole or probation. “If someone has a history of drug use or is homeless, that tells me a lot about their ability to make good choices and helps me make a determination about bond,” Kohlrieser said. “I have to consider ‘are they likely to appear?’ for court hearings or ‘are they a danger to society?’ when it comes to setting their bond. Sometimes I even have defendants’ family members call up and say, ‘Please keep them in jail for their own safety,’” Kohlrieser said. In local counties, judges in municipal courts in Lima, Auglaize County and Putnam County initially set bonds in cases that are not the direct result of grand jury indictments. “And we have a local rule that says if bond is established in municipal court, we (common pleas court judges) will continue that bond here until such time as a motion is filed” by defendants’ attorneys to further discuss the issue, Kohlrieser said. Kluge said he doesn’t necessarily see the need for state lawmakers to become involved in an overhaul of the bail system. While judges are required to consider the potential danger to the community in determining bond, in some cases suspects with sufficient financial means do walk out of jail while their less wealthy counterparts sit behind bars on nearly identical charges. But Kohlrieser said judges “don’t look at a person’s financial situation” when setting bond. Even Kluge, who loves to say he spends his days “fighting injustice,” does not believe the current bond system in Ohio is tilted in favor of the wealthy and against the poorest of criminal defendants. “As long as there is such disparity on a county-by-county basis, you can’t really say it’s tilted against anybody,” he said. Waldick said there is no incentive on the part of the state to keep people behind bars longer than necessary. The United States and Ohio constitutions require that incarcerated defendants must be brought to trial within 90 days of their arraignment, unless they voluntarily waive those rights. Persons free on bond must be brought to trial within 270 days. “It doesn’t do the state any good to have someone sitting in jail awaiting trial who shouldn’t be incarcerated,” Waldick said. An all-too-real by-product of high bonds and obstinate defendants is jail overcrowding. The Allen County jail, which opened its doors in May 0f 1990, was designed to hold 202 inmates. The jail’s average daily population in 2017 was 265 inmates. In 2018, that figure stood at 275 and, according to Public Information Officer Andre McConnahea, the average daily jail population has topped 300 on several occasions. The average length of stay for an inmate in the Allen County jail is 25 days, according to recent statistics. Approximately 85 percent of the inmates booked into the jail are released within one month; 7 percent serve sentences longer than three months, and just one in 10 serve sentences of one year or longer. The average daily population at the Allen County jail increased 16.14 percent between the years 2014 to 2018, McConnahea said. In 2014, the jail was considered overcrowded on 123 days; in 2018 that figure stood at 365 days. But Waldick said having defendants sit in jail awaiting trial is not a drain on taxpayers. “The jail is a pretty set cost. They still have to have the same number of jailers and other set costs,” the prosecutor said. “Having someone not make bail doesn’t really cost the taxpayers any money. It’s not really a consideration.